« What Does Hard Water Mean for You and Your Pipes? Alright, so chemical drain cleaners are “good” for some clogs. Most are good at dissolving hair, which is a common problem in bathtub and shower drains. This doesn’t mean they’re good for your pipes, though! And if you have items like grease and grime, food particles, or any other blockages aside from hair clogging up your pipes, then chemical drain cleaners are going to be ineffective, anyway. This would be unintentional, of course. But some of the particles that chemical drain cleaners cannot dissolve often get pushed further down your drain pipe, leading to deeper clogs than you started out with and requiring professional tools and equipment to remove, anyway. Additionally, without the effective elimination of leftover greasy residue from things like kitchen clogs, they’ll just be encouraged to develop again. Yes, these store bought drain cleaners have side effects. For instance, they can be harmful to people and pets due to how toxic the chemicals are in them. Rubbing your eye after not fulling washing your hands, or having a pet accidentally getting into some that’s dripped on the floor can lead to a very dangerous situation. Plus, these chemicals are caustic. 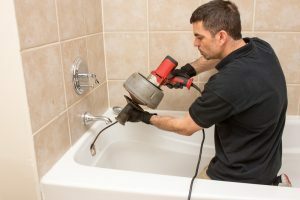 That means that prolonged use of these drain cleaners (which, since they’re ineffective at removing the clog permanently, you’ll undoubtedly experience) eats away at the lining of your drain pipes, leading to premature replacement of your plumbing. We aren’t exactly saying that. If your drain isn’t clogged but has a funky smell to it, there are certainly steps you can take. For instance, you might try mixing half a cup of baking soda with a cup of vinegar and pouring that down your drain. Wait 15-30 minutes, then wash that all down with hot water. If you do have a clog, and it’s close to the surface of your drain, you might just need a plunger and a bit of elbow grease. But if your drain is stubbornly clogged and nothing you try helps, then it’s time to call for professional drain cleaning. Our pros will use a method like drain snaking, or hydro-jetting for harder clogs. Either or both of these can be extremely effective at not only removing the clog, but making it less likely for blockages to develop in the future. You may have seen us mention hydro-jetting on our blog before. It utilizes a high-pressured hose with an omnidirectional sprayer for optimal coverage within your drain pipe. Professional drain augers are especially helpful for blockages deep within the sewer line. Call BZ Dependable Plumbing & Heating Inc. today for exceptional customer service!